Data assimilation (DA) is a technique by which numerical model data and observations are combined to obtain an analysis that best represents the state of the atmospheric phenomena of interest. At HRD, the focus is on the utilization of a wide range of observations for the state analysis of tropical systems and their near environments to study their structure and physical/dynamical processes, and to improve numerical forecasts. 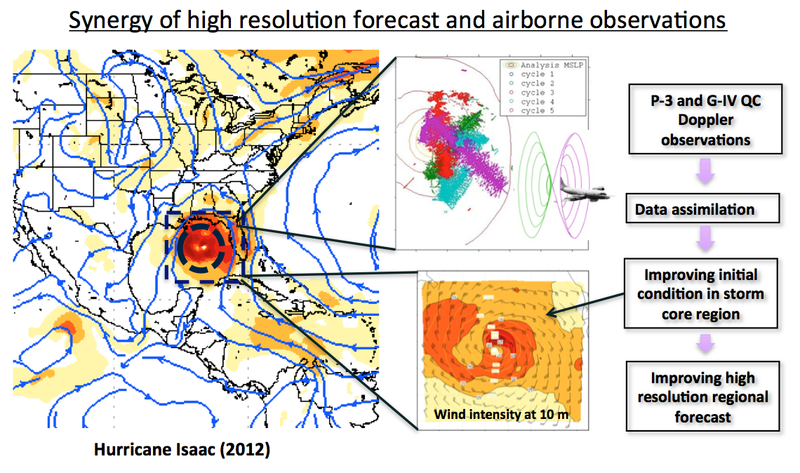 Research includes the development and application of a state-of-the-art ensemble-based data assimilation system (the Hurricane Ensemble Data Assimilation System – HEDAS) with the operational Hurricane Weather Research and Forecast (HWRF) model, using airborne, satellite and other observations. In parallel, Observing System Simulation Experiments (OSSEs) are conducted for the systematic evaluation of proposed observational platforms geared toward the better sampling of tropical weather systems.